The Orono Land Trust is entirely a volunteer organization. There are many opportunities your involvement. Whatever your skill or interest, there’s a place you can make a difference. If you’re interested in joining the group of volunteers, please take a few minutes to fill out our Volunteer Questionnaire. With the submitted information we can contact you about upcoming volunteer opportunities that match your interests and preferences. Easement monitoring –Accepting an easement obligates the Land Trust to ensure that the terms of the easement are met. In practice this generally means walking the boundaries of a property once or twice a year to observe and document conditions. Trail building and maintenance – Add you effort to our Spring and Fall TRAIL WORK DAYS when we spread chips, trim trails and other simple tasks. 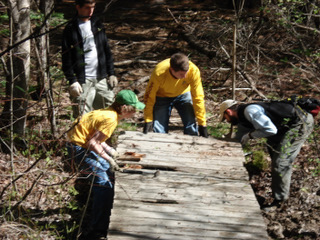 Build bridges, boardwalks, for trails. Assist in improving habitat such as removing invasive species or replanting native species. Lead tours and outings – We plan outings of various types to encourage members of the community to get out and see local land conservation in the area. Public outreach – Do you have expertise in wildflowers, bird-watching, or organic lawn maintenance? How about a slide show of your hike on the Continental Divide Trail or your week at El Eden? Sponsoring conservation and preservation-related presentations and workshops can help us raise awareness of issues as well as encouraging others to join us. Photography – Photographs are useful for documenting and protecting easements. They are also wonderful tools for public education and publicity brochures, posters and handouts. Aerial photographs of our region are helpful. Research and documentation – Land protection projects often involve extensive research in dusty records: deeds, maps and public documents. Once a piece has been identified and, perhaps, protected by easement or fee ownership, maps and descriptions of its boundaries and conditions are essential to maintenance and enforcement. Publicity – Press releases and letters, photo opportunities and public gatherings: the more we can get the word out, the better our ability to protect and preserve land. If you like to write, take pictures, make phone calls and talk to people, you can help. Could you mind a table at Orono Festival Day? Maybe write an occasional newspaper article? We’d love to hear from you. Fundraising – The bottom line is – the bottom line. Like any other non-profit, the Land Trust needs money to accomplish its goals. Whether you have experience writing grants or running bake sales, the Land Trust can use your assistance. Membership committee – We’re always trying to build our membership. Refreshments – Every gathering is more fun with food! Annual meetings, guest speakers and public outreach events all call for a table full of goodies. If you enjoy cooking, we can assure you of an appreciative group of tasters. Expertise – Over the years, the Orono Land Trust has been very fortunate to benefit from the advice and donated services of scientists, attorneys, surveyors and developers. Maybe you’re a retired wetlands scientist, an amateur historian, a GIS mapping consultant or an Autocad whiz. Or maybe you did your masters thesis on eastern coyote migration or accounting methods for non-profit corporations. We’d love to give you a chance to demonstrate your skills.